Isn’t this just a matter of opening up the project, changing one line and recompiling? Should take five minutes, it’s not really a big deal? Yes and no. The 64-bit change itself is small but they change enough other things every few months that recompiling against new versions of the libraries doesn’t simply work. You get a few linker errors and have to look up the new names for a couple of functions. Or there’s a new element in one of the libraries with the same name as one of my variables so I have to find+replace to change its name. And then you run it and find that it’s in portrait mode, squished into half of the screen, so you have to look up what changes they’ve made to how screen orientation works and change a few more lines. Or the graphics are scrambled or just blank because they changed something in how shaders work. Then test everything to make sure nothing else has changed. Then upload it and it comes back with an error, you need to add two more lines to the info.plist file to say that no, you’re not going to be using the device camera or location. Upload again, the build is accepted, you go onto the store backend and try to submit the update and it turns out now you need screenshots in three additional sizes. It adds up. 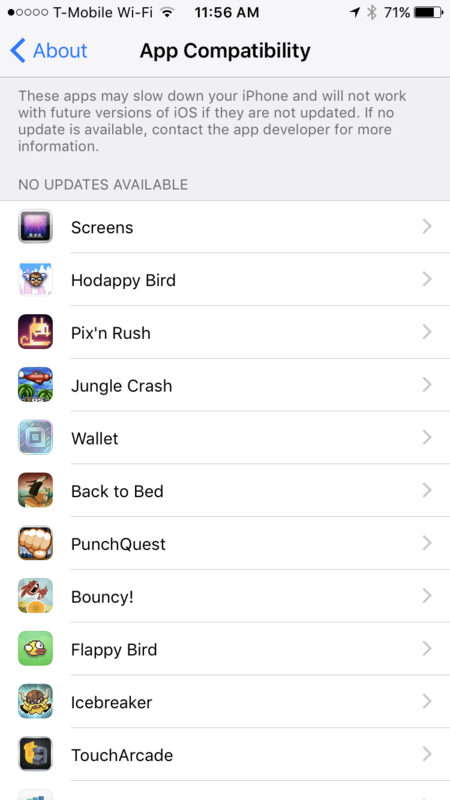 While it’s great to see a classic game like 868-HACK get updated, the worrying trend remains that we’re basically watching the history of the App Store disappear, a topic we’ve written about in the past. If you want to see the apps on your phone which aren’t updated and might eventually get the axe depending on how Apple moves forward, go to your device’s settings, then select General, then About, scroll down to Applications and tap it. You’ll see a screen that looks like this. Chances are some of your favorite games and apps will be in there. I guess we’ll see what happens in the future, but if nothing else, it’s great to cross 868-HACK off my list of games I love that I really don’t want to lose to the weird policies of the App Store. Hopefully other developers follow suit, but with nearly zero financial incentive to do so, it’s hard to imagine many more ancient classic apps getting 64-bit support.